Desfontainia Ruiz & Pav. is a genus of plant that contains one species, Desfontainia spinosa, a native of Chile that is also known as Taique. The uses include medicinal purposes and as an ornamental, shade-loving, frost-hardy, evergreen shrub. 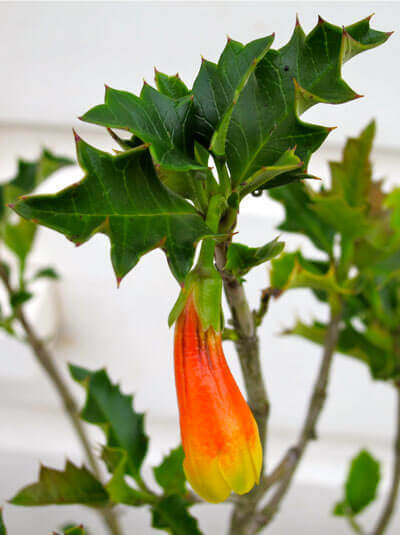 It grows to two metres in height and width and has glossy dark green leaves that are holly-like in appearance and glossy red tubular flowers with yellow tips. The species was introduced into cultivation in Europe by William Lobb in 1843. Full shade. Winter Flowering. Height to 1mt.